On this action-packed journey we discover some of the world's most remarkable archaeological sites including the Pyramids and Great Sphinx of Giza. In the vibrant Nubian city of Aswan we board our Nile cruise boat, set sail and explore the temples of Edfu and Kom Ombo on our way to Luxor, where we visit the Valley of the Kings and Karnak Temple. Arrive in Cairo and check-in at our hotel. Cairo is Africa's second largest capital city and is a vibrant, exhilarating and welcoming city. Home to the best Pharaonic, Coptic and Islamic sites in Egypt, there is an incredible amount to discover here. If you arrive early you may wish to catch your first glimpse of the mighty Nile River, visit the capital's medieval market at Khan el Khalili or walk down the Nile promenade. This morning we make our way to Giza, where we see the Pyramids and Sphinx; among the most impressive man-made spectacles in the world. We explore the pyramid complex, which includes the Sphinx, a crouching lion with a human head carved from solid rock and the splendid Granite Temple, with a local guide. After the Pyramids, we visit a papyrus institute, where we will learn about the ancient methods of paper making in the Egypt of the Pharaohs. We'll then have a picnic lunch before visiting the Egyptian Museum; a spectacular repository of over 120,000 items encompassing all aspects of ancient Egyptian life, including ornate jewellery and towering granite statues, mummified remains and, of course, the remarkable golden treasures of Tutankhamun himself. This evening we enjoy a traditional meal in a local restaurant. Today is a free day for optional trips in the capital. This morning there is the opportunity to visit Saqqara, the impressive steppe pyramid/necropolis of Zozer (Djoser) - the earliest of the pyramids of Egypt; whilst this afternoon you can take a trip to Islamic Cairo to visit the illustrious Citadel, one of Saladin's many strongholds during the Crusades period. There will also be the chance to enter one or more of the medieval mosques of Cairo. Alternatively you could use this free time to revisit the vast Egyptian Museum. This evening we depart for Aswan on an overnight train in sleeper compartments. Aswan is Egypt's most southerly city, traditionally regarded as the frontier post of Upper Egypt. Sited on the east bank, it stands just below the First Cataract and is the meeting point of Arab culture with Nubia and black Africa. Today we have time to explore Aswan and the surrounding area. Our early arrival allows us time to take an optional excursion to the High Dam, Philae Temple marooned on a picturesque island, and the Unfinished Obelisk. Returning to our hotel around lunch time there is time to relax this afternoon and enjoy independent sightseeing. This evening there will be the opportunity to take a motor boat journey to a traditional Nubian village for a home cooked dinner with a family who have been friends with Explore for many years! Please note: If visiting the Nubian village, you may like to bring some small gifts for the children such as notebooks and pencils. However, please do not give sweets or money. After breakfast we offer an optional excursion across to the West Bank to St Simeon's Monastery. We travel here by boat and camel as we head out across the desert. One of the largest Coptic monasteries in Egypt, St Simeon's was built in the 7th century and abandoned in the 13th century. It now sits in isolation at the end of a desert valley, an impressive sight. A 45 minute camel ride brings us to the monastery where we will meet our local guide. After the visit we remount and return along the bank to our boat. We return to Aswan and board a river cruise boat, our home for the next three nights, just in time for lunch. This afternoon is free for you to enjoy the facilities on board and relax, or alternatively take a traditional felucca boat and sail around the Aswan islands including a visit to the Botanical Gardens. This evening's meal is served back on board. Today you may like to take a very early morning trip by bus or air to the fabulous rock-hewn temple of Abu Simbel. Cut into the rock face, this enormous structure was raised 61m to save it from floods created by the Aswan High Dam. The 20m high statues represent Ramses II, known as the great builder. We return in time for our cruise to begin and start sailing, heading north (downstream) towards Kom Ombo where we disembark. Situated on the banks of the river, this temple is particularly unique because it is dedicated to two gods; Haroeris and Sobek, the crocodile god. It is thought that this part of the Nile used to have a large crocodile population, hence the dedication to Sobek. This evening, we continue upstream to Edfu city where we overnight. After breakfast we disembark and visit the extraordinary Temple of Edfu, dating from the time of the Ptolemies (3rd -1st century BC). A sacred falcon-headed god guards the Temple of Horus, which is in almost perfect condition. We return to our boat and sail on to Luxor, arriving in the late afternoon which allows some free time to wander around the souks and busy streets before dinner. Tonight there is the opportunity to experience the Sound and Light Show at Karnak Temple, an incredible display where Karnak and the story of Egypt comes alive. This morning we disembark for the final time and drop our bags at the hotel before taking a traditional calesh ride (horse drawn carriage) to the Temple of Amun at Karnak, the labour of numerous pharaohs. Built around 2000 BC, this vast temple was still in progress during Cleopatra's reign during the 1st century BC. This afternoon is free to relax after a busy few days or you may like to visit the Workers Tombs and Habu Temple. Arguably Egypt's most well known site, this morning we visit the Temple of Hatshepsut and the Valley of the Kings. Pharaoh Hatshepsut is believed to be the most successful reigning female power of Egypt, no mean feat during Ancient Egyptian times, and was buried alongside her male counterparts in the Valley of the Kings. Historians throughout modern history offer contrasting information about her reign but walking into the shadow of Hatshepsut's immense temple, which is built into the limestone rock face on Luxor's West Bank, is a key symbol of her achievements. The structure is unexpectedly modern by design and was once linked directly with Karnak Temple on the East Bank. We will then transfer on to the world-famous Valley of the Kings, most well known as the burial site of Tutankhamun discovered in 1922 by British Egyptology Howard Carter, along with another 62 royal tombs. Our visit includes entrance to three of the tombs which will be decided on the day, as many are periodically closed for resting and renovation to protect them. After the three, there will be an option to pay a supplement to visit Tutankhamun's. We arrive back to our hotel in time to relax for the rest of the afternoon, or you may like to take a stroll to the Luxor Temple and Museum, both of which are within easy walking distance of our hotel. 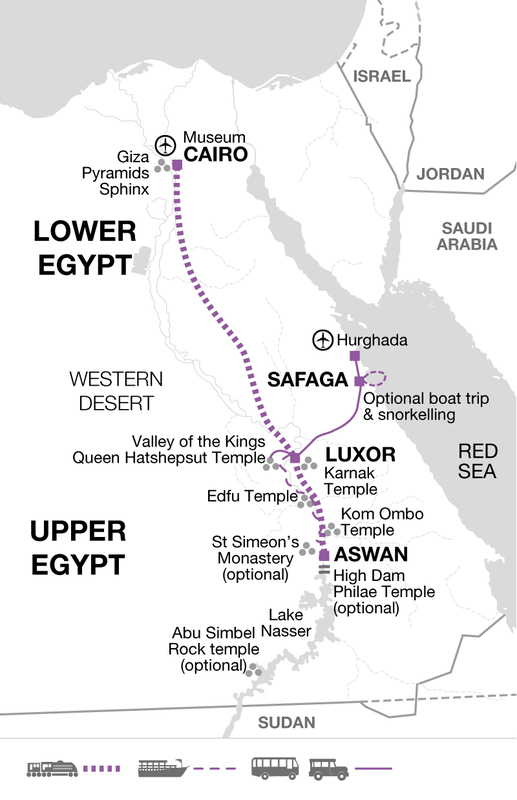 This morning say goodbye to our Explore leader and leave Luxor to make our way to Safaga on the Red Sea. The drive takes around 4 hours, so we will have the afternoon to relax when we reach the hotel. The Red Sea is famous for its superb coral reefs and multi-coloured fish. Schools of beautifully marked and iridescent species swim alongside barracudas and small sharks. There is the option to book a snorkelling trip by boat (6 to 8 hours) over the coral reefs around Safaga. Scuba diving is another possibility or you may prefer to simply laze on the beach or by the pool and enjoy the hotel facilities. Your time is your own; you can take it easy relaxing on the beach or by the pool and just enjoy your beautiful surroundings. Your trip ends after breakfast in Safaga. Egypt's climate is hot and dry, typical of a desert environment. In summer it can be very hot and remains hot overnight whereas winter days are milder by comparison and temperatures can drop considerably at night. The mildest area is along the Mediterranean coast with temperatures ranging from 23-31°C in summer and 10-17°C in winter. In the desert region temperatures fluctuate in summer dropping as low as 7°C at night and up to 40°C during the day and in winter it can vary from 0°C at night to 18°C in the day. Aswan is one of the hottest cities with Cairo and Alexandria generally slightly cooler. Egypt receives very little rainfall annually and rainfall in summer is very rare. A selection of optional activities are listed below to help you budget for your Egyptian adventure. Whilst the basic tour price you pay before you travel includes a great selection of highlights, we have also built in free time to allow you the flexibility to choose from a carefully selected range of additional excursions and activities or take time to relax, the choice is yours. At certain destinations along the way there may be several options to choose from and it may not be possible to fit all the activities in; your Explore Leader will be able to give advice on this. Excursion from Aswan by bus USD $110.00 per person or by air USD $350.00 per person. (The Abu Simbul excursion will be booked and payment take on the first day of the trip). Please note that all optionals prices are in US Dollars, though local currency, sterling and US Dollars are accepted. There is a minimum requirement of 5 passengers on some of the optionals. The above prices include transportation and local guides where necessary. Women are advised not to wear shorts or dresses that are too revealing as this can attract unwelcome attention in the streets of Muslim towns - loose fitting trousers or slacks are ideal. Women should also cover their head and shoulders when entering a mosque and men should wear long trousers. Comfortable shoes and sandals are recommended. Bring a water bottle, insect repellent, sunglasses and a small torch for examining wall carvings. Please note that on the optional donkey trek we cannot supply hard hats - if head protection is felt to be necessary please bring your own with you to Egypt, as hard hats are not available to buy locally. You may want to bring wet-wipes and water-free hand sanitiser will be an invaluable addition to your daypack. Ear plugs are recommended for the overnight train from Cairo to Aswan. Accordingly, you should allow £30.00 per person for group tipping. We recommend that you bring your money in cash, £GBP, US$ or Euros which are readily changeable. You may also bring an ATM card, as these are available in main towns. Please contact your bank prior to travelling to determine if your card will work in Egypt. Credit cards are rarely accepted. Please contact you bank prior to travelling to determine if your card will work in Egypt. You may find it useful to bring some Travellers Cheques as a back up. On the overnight train we use individual compartments, each containing a bench seat which converts into bunk beds. The carriage steward sets this up and provides bed linen, blankets and pillows. Each cabin is lockable and has a night light and cupboard that houses a small sink, shelf, mirror, towel and power socket plus there is a removable table top that folds into the wall. Dinner and breakfast is delivered by the carriage steward directly to you. Two western style toilets are located at the end of each carriage and there is a communal lounge carriage with a bar serving soft drinks. Egypt: An entry visa is required by all nationalities. UK citizens can obtain a visa on arrival at the airport for the current cost of 25USD. Please note, you must purchase a visa stamp at one of the nearby banks before proceeding to the immigration desk. Alternatively you can obtain a single entry E-visa prior to departure via the e-visa website: https://www.visa2egypt.gov.eg/eVisa. You will need to print a copy of your e-visa approval letter and present this with your passport and final documents at immigration upon your arrival. The approval letter will take a minimum of 7 days to be processed so we strongly advise for you to apply within plenty of time before your departure. You will be permitted to stay within Egypt for up to 90 days. We strongly recommend for you to read the How to Apply and FAQ sections on the e-visa website before applying. Please ensure you read the FCO advice if you are travelling with prescribed medication. Nothing compulsory but we recommend protection against typhoid, tetanus, infectious hepatitis and polio. Though malaria does exist in Egypt it is not normally found in the areas in which we travel. Please note that all travellers aged over 9 months old will be required to supply a yellow fever certificate if you have travelled from or have transited via a country with a risk of yellow fever transmission. Please check the latest requirements with your travel clinic or doctor prior to departure. The above is not an exhaustive list. Further information regarding vaccinations and travel health advice can be found by following the NHS and NaTHNaC links at Explore Travel Health and from your local healthcare provider. Visa and vaccination requirements are subject to change and should be confirmed by you before travelling.